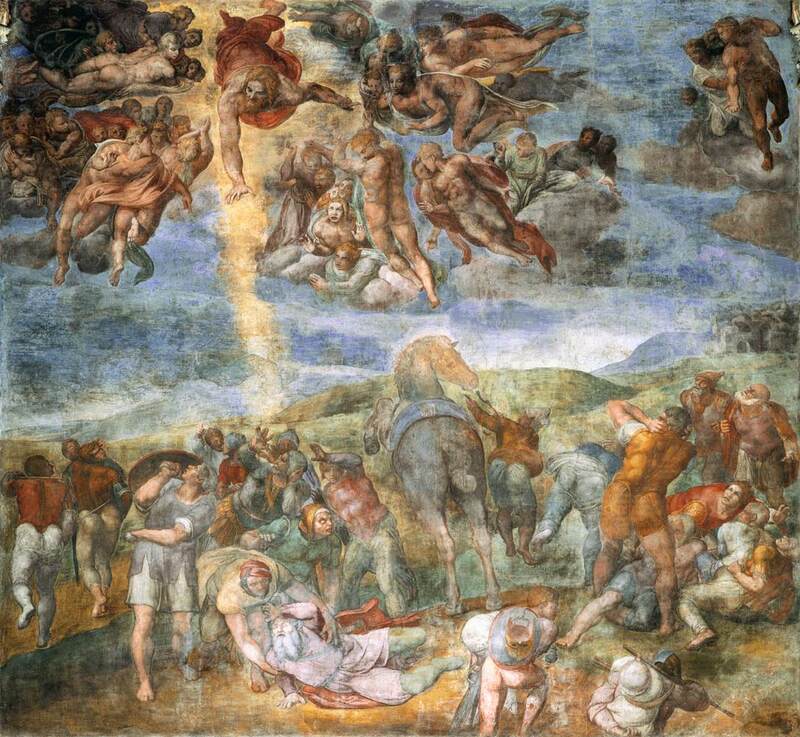 The Conversion of Paul, Michelangelo, 1545. Sistine Chapel. This Sermon was preached at 10am on Sunday, January 25, 2015, at S. Stephen’s Church, which was kept as the festal mass for the Conversion of St. Paul. Today is also the third Sunday after the Epiphany, which propers were kept at 8am. Music at the 10am was Herbert Howell’s Office of Holy Communion (Collegium Regale), with the Peter Philips anthem Beati estis. Collect: O God, who by the preaching of thine apostle Paul, hast caused the light of the Gospel to shine throughout the world: Grant, we beseech thee, that we, having his wonderful conversion remembrance, may show forth our thankfulness unto thee for the same by following the holy doctrine which he taught; through Jesus Christ our Lord; who liveth and reigneth with thee, in the unity of the Holy Spirit, one God, now and for ever. Amen. Today we keep the feast of the Conversion of St. Paul. It’s a day when we have a lot to be grateful for: apart from the events of Our Lord’s own life, death, and resurrection, and the descent of the Holy Spirit at Pentecost, today’s feast probably has more significance for church history and the development of western civilization than any other event in history. Paul’s letters and missionary journeys are simply amazing, the stuff real legends are made of: shipwrecks, imprisonments, dramatic miracles and mass baptisms, church councils, even an address to the Roman Emperor himself. He is the great missionary apostle, and he laid the foundation for the Gospel in Europe – and by extension, to us too. But today we keep the feast of his conversion specifically. We know the story — it’s one of those few Bible stories that still seems to have purchase in an age where many struggle to remember even such pivotal characters as Moses and John the Baptist. Paul, then called Saul, was on his way to Damascus to persecute Christians there, when all of a sudden a great light appeared to him on the road, and he fell from his horse struck blind. A voice calls to him, and he learns it is Jesus, whom Saul is persecuting. He continues to Damascus, but not to arrest anyone – rather to be baptized by Ananias whereupon he regains his sight, and then receives instruction in the faith for a period of several years. The rest is history. When we think of conversion these days, it’s easy to think of math, or of chemistry: something gets changed, from what it was before, to a different value or unit, or even to a different substance altogether. It’s easy to think the same thing about faith, and there are plenty of televangelists and authors of so-called Christian books out there to sell you this idea, and line their own pockets in the process. The conversion of Paul is often the poster child of this impulse: a “Damascus Road Experience” we sometimes hear people say, and even say ourselves. But Christian conversion is not an instantaneous change into some other unit or substance. Nothing could be further from the truth. “I once was blind but now I see” — words by John Newton from Amazing Grace, and they are certainly true for Paul. But neither Paul nor John Newton ceased to be Paul or John Newton. Their sins were forgiven, and they were made members of Christ’s Body in baptism; but even if Paul had a new name, he didn’t cease to be who he was. The same faith, the same righteousness, the same zeal which had characterized his whole life so far, remained undiminished. And the very same faith, the very same righteousness, the very same zeal was put to use in spreading the Gospel all over the known world. The Snake Oil Salesman seems to be a uniquely American weakness. I’m sure it occurs everywhere around the world, but here it seems to have a special hold on us. The Snake Oil phenomenon takes many forms, but it always boils down to getting something for nothing; taking a magic pill that fixes all your problems; changing lead into gold for nothing but the gold already in your pocket. The Snake Oil Salesman always makes us poorer. And yet so much of the time, we want religious conversion to be just like one of the Snake Oil Salesman’s magic bottles. And like many people who have been bamboozled by magic ointments, we can go to great lengths to convince ourselves that it has worked. How many stories do you hear about sudden and radical changes in someone’s life thanks to the direct intervention of God’s grace? And how many stories do you read about influential people in that category who have been brought low by the revelation of their all-too-human weaknesses? Reading Paul’s letters, it’s easy to see he was probably not any nicer of a person after meeting Jesus on the Damascus road than he was before. It’s obvious that none of his personal qualities were altered in any way. If anything, everything he was before was merely intensified, not reduced or changed into some other more palatable substance. Why do we expect religious conversion to work any differently with ourselves? And still we long for the possibility of being different, of being better people. As much as Paul stayed the same person after his conversion as he was before, still it is incontrovertible that he did in fact change, in some clearly perceptible ways. What made the difference for him? What makes the difference for us? Many of you know I was on retreat this last week, something I try to do annually but don’t always have the time to do. I’m very grateful to have been given the time this year, and I’m very grateful for your prayers while I was away. The place I go for this is a monastery called Christ in the Desert, high in the mountains of northern New Mexico. It is a Benedictine community, following the Benedictine Rule according to “The Strict Observance.” You may know that one of the chief hallmarks of monastic spirituality is a commitment to what they call “conversion of life.” One of the things this means for them is that conversion is a lifelong process: not an instant transition from one category to another, but a daily decision to live for Christ over self, and to do the daily hard work of seeking him first over all. It is a process of continual repentance, and therefore of continual humility. They will be the first to tell you that they haven’t “arrived” yet, and nor will they until they see God face to face in heaven. You and I have to go through a similarly long, similarly arduous process, of continually putting to death the old self, of continually admitting our faults, failings, and sins, and of continually accepting God’s grace to make us more and more like him: so that we are more and more able to recognize his will and to do it. This is part of what makes Christian conversion different from so many Snake Oil ointments. But what about Paul? He actually did see Christ face to face on earth, and however disciplined and consistent he might have been, this was still a watershed moment. What makes it a moment of conversion? Certainly he changed his mind about Jesus, from thinking he was a false Messiah to owning him as the Incarnate Son of God. But there’s more to it than this. On the Damascus Road, Paul has seen Jesus in glory, and now he knows the One who calls him. For us the task is the same: to know the One who calls us. This is conversion: not a magic pill to make us nice, or righteous, or whatever, but the opening of our eyes to see and know him who calls us out of darkness into his marvelous light. We do this by making choices to put Christ first above self, to seek him in all things, to believe his word, to accept the gifts he offers, to serve him in all the places where he himself has said he is to be found, taking responsibility for our sins and humbly asking forgiveness. In making these choices (hard choices!) every day, year in and year out, we set ourselves about the task of conversion. Far from becoming something we are not, it makes us more and more what we were created to be, in the image and likeness of God. Does all this sound familiar? It might: Patience, humility, being focused on someone else, eschewing possessiveness, practicing generosity, credulousness, hopefulness; endurance to the end. This is exactly the way Paul describes Love in the famous passage from 1 Corinthians 13, read at so many weddings and even funerals. To work towards our conversion is to work towards knowing the One who calls us; but even more than this, it is to love him, and to dwell in his love for us, for our neighbors, and for the world. Before the road to Damascus, Paul knew about righteousness. He knew the Scriptures, he had great faith, and he was very zealous for the kingdom of God. But what happened on that road, and what we celebrate today, is that he was given also to know the Love of God, and to see it face to face in our Lord Jesus Christ. That made the difference to him, and that makes the difference to us. “So now faith, hope, and love abide, these three, but the greatest of these is love.”  At the beginning of this new year, at the beginning of a new term, let us commit ourselves to a continual conversion of life, becoming more and more proficient in the love of God. So “our hearts shall be enlarged, and we shall run with unspeakable sweetness of love in the way of God’s commandments.”  So may we finally come to our heavenly home, and behold Him face to face who is our Redeemer, Brother, and Friend. Rule of St. Benedict, Prologue. Translated by Abbot Justin McCann, OSB, 1951.